In the department of “virtue out of necessity,” I bring you the story of DEXTROSE. Dextrose candy: doesn’t quite roll off the tongue. In fact, if you don’t know what dextrose is, which I confess I didn’t until I started Candy Professor, it doesn’t even sound edible! But for most candy-buying and eating purposes, dextrose is just another kind of sugar that can be used for particular candy effects. In particular, “compressed dextrose” is the technical term candy people use to describe the powdery hard candies: Altoids, Smarties, candy necklaces, and all those Made-in-China candy trinkets like robot puzzles and building blocks that you can eat when you’re done. But still, what is dextrose? Dextrose is sugar produced from corn. Today is is one of many many kinds of sugars that food processors can use for various effects. Like compressing it to make candy necklaces. But in the 1930s and 1940s, dextrose was the major competitor and substitute for the more traditional refined sugars from beet and cane. Americans did not automatically embrace sugar from corn. As we can see today in the backlash against high fructose corn syrup, American consumers are suspicious of the whole corn refining process. In my next post, I’ll take a look at the marketing materials produced by the Corn Refiners Association back in the 1940s to sell Americans on this new kind of sugar. The story I want to tell today is about dextrose and candy: how candy makers took a problem, sugar shortages, and turned it into a big candy plus. As WWII disrupted the world food supply, cane and beet sugar prices were rising and sugar shortages seemed likely. But sugar made from corn was not affected. So food processors began looking for ways to use corn sugar in the place of more expensive beet and cane sugar. Beet and cane sugar processors were not happy about this; in 1940 they sued to force peach canners to identify dextrose as an ingredient when they used it as a sugar substitute. This lawsuit shows how the public acceptance of dextrose was in transition; the department of Agriculture had allowed use of dextrose without disclosure on the grounds that it was not an injurious ingredient. But the beet and cane sugar refiners seemed to think that peach canners might be less likely to substitute dextrose if they had to claim it on the label. Sweet is sweet, but the sugars are slightly different. Cane sugar and beet sugar, you may recall, are “disaccharides”: they combine glucose, which our body uses directly, and fructose, which is first metabolized by the liver. Corn sugar, called dextrose in processing uses, is virtually all glucose. If you had to claim “dextrose” as an ingredient, it might turn consumers off. After all, what exactly was this dextrose to the average American? It sounds kind of chemical-ish. But instead of “cheap sugar substitute,” what if you could sell it as a miracle food? And so, dextrose stormed the market as: PURE ENERGY! See the little guy on the side? He’s sort of the candy bar cheerleader, and in the 1939 wrapper he’s saying “Slice and Serve for All Occassions.” Fancy! By actual energy tests, a 150-lb athlete can run almost 4 miles at a speed of more than 5 m.p.h. on the FOOD ENERGY contained in one 5c bar of delicious Baby Ruth candy. And even though “dextrose” sounds like a pitch for the newest scientific views, the strawberries and the ad copy reassure us that dextrose is all natural and all good. And here’s N.R.G. in 1942: Baby Ruth gives food energy to soldiers overseas and office workers at home. And what about that mama with the little baby? 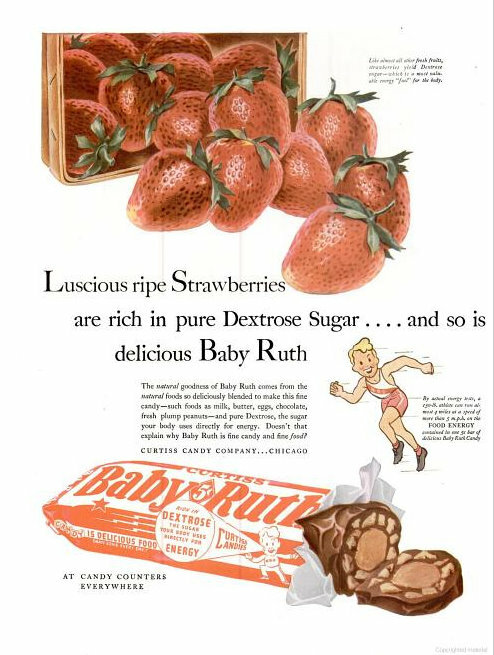 Dextrose is “an essential in infant feeding.” Is that candy bar for hungry mom, or sweet-loving baby? Glue-cose, Or, Why we call it “Corn Syrup” Back in the early 1900s, corn growers were having trouble selling their corn-derived sweetener known as “glucose,” because everyone thought it was made of glue. Enter “corn syrup,” wholesome and pure sounding, until now. Corn People: How It Started In the old days, corn was animal feed. WWI food shortages changed everything. Now corn was patriotic people food. Corn Into Candy: 1918 With WWI sugar rationing, candy makers showed their stars and stripes by substituting corn syrup and other corn-derived ingredients. Beer and Candy III: Annheuser Busch and Corn Syrup Prohibition gave the shift to corn sweeteners an extra boost when beer makers looked for something else they could do with grains. Sweetose: Better Candy from the Chemistry Lab Sweetose was modified corn syrup, made sweeter by combining maltose with glucose. A forerunner to high-fructose corn syrup. Entry filed under: Ingredients, Marketing, WWII to 1960s. Tags: baby ruth, corn sugar, curtiss.